we hereby sincerely invite you to come and visit our exhibition booth at IFA from 1st to 6th September, 2017. We will demo some NEW products there! Exhibition address: Messe Berlin Messedamm 22, D- 14055 Berlin, Germany Booth No. : Hall 17, Stand No.124. Inmotion Technologies Co., Ltd / Solowheel China. Welcom everyone to this exhibition , we will demo new amazing products, and enjoy your E- life! Thank you for the kind invitation! Can you please provide the EUC Forum members some information pertaining to the release of any newly designed electric unicycles that your company will soon be marketing? Thank you for the kind invitation! Can you please provide any relevant information pertaining to the release of any newly designed electric unicycles that your company will soon be marketing? Okay, actually we not only manufacture & design the electric unicycles, but the electric bike, electric skateboard, we may show the public the elegant shaped e- bike & e- skateboard ( there is a new kind of way to control the e- skateboard that you can hardly find in the similiar products of other brands ), all of these products will soon be marketing. For more information, you can follow me, I will post more information in the future, thanks. Cant make it myself but excited to see what you guys have planned! Thank you for the kind reply. Looking forward to hearing more about your newly designed products! Wow, that is our V5 series! Thank you for supporting our products, if you have any queries about our products & after- sales service, pls send E- mail to me at: king.ma@imscv.com, thanks! "We -- INMOTION technologies are now looking for dealers, exclusive agencies all over the world to change the way of personal transportation, if you are interested, pls contact me at: king.ma@imscv.com "
To be honest a lot of people's faith in Inmotion (which used to be of the highest admiration) has been severally dented by the deal with Solowheel and the rumours that, in the USA at least (but it is not at all understood if this also means the rest of the world too) prices will rise to at least 150% and specification of the V5 will be reduced - I.e. No longer able to buy the excellent V5F+ version that everyone really likes and was sold by @Jason McNeil a very trusted and respected member of this forum. As a direct result of this, if you look through recent posts on this forum from new members looking for recommendations for what to buy you will find that, in every case now people are being told to forget Inmotion and buy a KingSong or Gotway. It is not us Moderators or the forum itself that are saying this, it is a significant number of our members who are horrified by what they are hearing and have assumed it may be a global deal. Can I recommend that you explain what is happening with Inmotion vehicles in the USA and elsewhere as, currently, the lack of information from Inmotion is the very reason that everyone is saying do not buy them. That does not make it sound any better, upping the price for the exact same product by any amount of % will always be received badly. Innovate it and then people will consider the higher price. This way they will just look at other products. 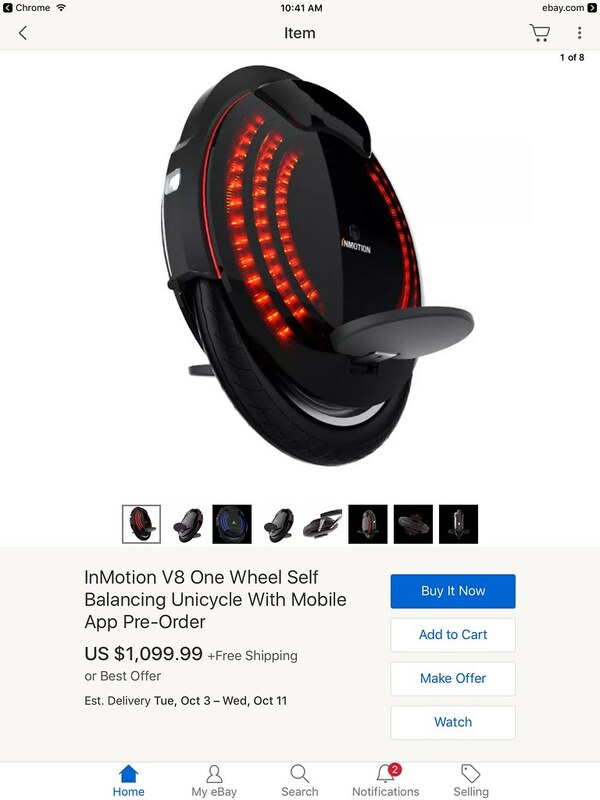 @King Ma - INMOTION, among the best EUC manufacturers (Ninebot, Kingsong, Gotway, IPS), Inmotion is the last one not to have announced any new products in 2017. We are looking forward to seeing what's coming up, hoping that they can deliver innovation and/or good quality/price ratio in the EUC space. Products like Gotway Tesla/Mten 3, Kingsong S series and Ninebot One Z serie have blown our mind on the high-end. On the low/medium end segment, the new offer is quite poor atm. So competition is exciting and I cannot wait to see what you are coming up with. On the Solowheel deal, this is confusing most potential customers I know, so the sooner you can explain this deal, the better. Solowheel cooperation was a big mistake! Will there be a new Inmotion ELECTRIC UNICYCLE at IFA? People here won't be too happy if they are hyped and then it's an electric scooter or something which is not an electric unicycle. We always devote ourselves to developing & reserching new ways of short distance transportation, the e- unicycle is just one way to change the world, there are series of different e- transporters, such as e -scooter, e- skateboard, we improve their performance as well to make our products to be the most creative in the industry ( take an example, we will demo the public a new kind of way to control the e- skateboard ), and more different e- transporters is a good deed, isnt it? As to the cooperation with Solowheel, I think our leaders have their own perspectives, they all want to bring benefits to those, who trust us and love our products as well, we will always provide high quality products with good price. We devote ourselves to providing the customers all over the world high quality products with good price, and developing & reserching new different e- transporters in the mean time to make our products to be the most creative & innovative in the industry, thank you. First, thank you for supporting INMOTION products, I believe that you and us, we all wanna change the way of short distance transportation, and enjoy the e- life provided by the new technologies. Before starting new products plan, we need to predict the development direction in the future of these products, and take many factors into consideration, then we make the product strategy( for instance, its not always right & good to adjust the max- speed, if take the SAFETY into consideration. So we may make our products more stablely & good- looking, and with longer mileage). The e - unicycle is just one tool to overturn the troditional transporters. there are series of different e- transporters, like e -scooter, e- skateboard and e- bike, we improve their performance as well to make our products to be the most creative in the industry ( take an example, we will demo the public a new kind of way to control the e- skateboard ), and more different e- transporters is a good deed, isnt it? Second, as to " the rumours that, in the USA at least (but it is not at all understood if this also means the rest of the world too) prices will rise to at least 150% and specification of the V5 will be reduced - I.e. No longer able to buy the excellent V5F+ version that everyone really likes and was sold by ", yeah, its a complete rumour, we devote ourselves to providing the customers all over the world high quality products with good & fair price, there is a saying in China:" The rumour stops when it comes to a wise person ", so sincerely hope you all neglect the rumour and enjoy the products and have a good experience. Third, on the Solowheel deal, I think our leaders have their own perspectives, they all want to bring benefits to those, who trust us and love our products as well. There is a another saying that: " To rise abruptly based on its accumulated strength ", trust us and we will give you all the choicest goods. I think our leaders have their own perspectives, they all want to bring benefits to those, who trust us and love our products as well. No there will not be any new EUC's at the show! The "Rumour" bit is only in reference to the rest of the world (well I was playing devil's advocate saying it) The Solowheel deal is a done deal in the US. Did I mention there will be a REALLY innovative way to control an e-skateboard. Nobody can resist the great God Shane - all hail and bow down unto him. 2. lots of new products, not " only "
Forum members dislike rumors but we would appreciate sound facts! It sounds like you are in a position that can dissolve such rumors. The 150% rise in prices appeared to come from a reliable source. If you dispute these significant price increases can you at least calm everyone's fears and provide an estimate of the increase.....if any? You are exactly right and @King Ma - INMOTION has distorted the facts! If you factor in the current average cost of a V8 at $1099 x 150% the cost jumps to $1648.00. There are are a few listed on Ebay where you can saves hundreds but they are going fast! @King Ma - INMOTION please explain why we are constantly being deceived. Point 3 says absolutely nothing and will (indeed is) seen by a western audience as deliberate avoidance of the entirely unanswered question. i.e. (My bold and underline above) "EXCLUSIVE" = to the exclusion of all others. So you HAVE clearly stated that you are looking to create exclusive agencies around the world. I'm sorry, but you are doing yourself and Inmotion no favours at all by appearing to resort to lies and avoidance. A real pity as I really like the Inmotion V8 but I wouldn't touch the Solowheel Glide 3 at its price. Given that most of us are not native speakers and lawyers, it might not be entirely clear what "exclusive agencies" is precisely referring to though. please explain why we are constantly being deceived. you have to admit that the Solowheel logo is much cooler than the InMotion logo and easily worth additional $300. It was probably also quite expensive to get it on the wheel And maybe it even works with the InMotion app. I would say give @King Ma - INMOTION a bit of a chance to represent inmotion and accostum to the forum - he got quite some (deserved) "headwind" till now. We are happy to get manufacturer representatives here - but should be aware that their possibilities are very limited!